Love for our jobs, co-workers, and patients will drive us to be the first & the only choice for quality care in the air. 24 Hour intensive care air ambulance transportation. Downloadable app for one step dispatch. Follow our Rico Family on our blog. Rico Aviation is dedicated to providing comprehensive, compassionate, high-quality air ambulance medical care to patients needing fixed-wing aeromedical transport throughout the Continental United States. Rico Aviation is a complete bed-to-bed service utilizing the latest, state of the art equipment available. We strive to provide the highest quality of care possible. 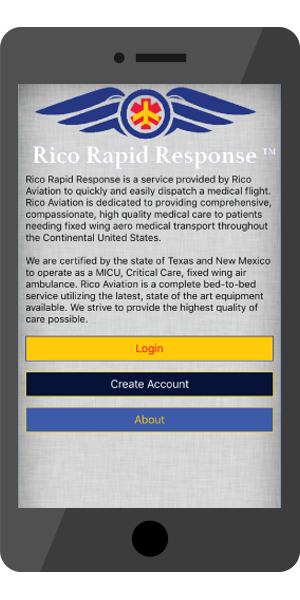 Rico Aviation is a fixed-wing air ambulance company family-owned and operated in Amarillo, Texas. We are available 24 hours a day for emergency transportation. Rico Aviation has an elevated standard of care. Our care starts at the bedside and continues through the flight until the patient is safely at their new bedside. We only have the best pilots, nurses, and paramedics on our team. Pilots are required to have the highest rating, and our nurses must have advanced certifications. Because of this, most of our patients get more stable in our care. We are certified by the state of Texas, New Mexico, and Colorado to operate as a MICU, Critical Care, fixed wing air ambulance. Copyright © 2019 Rico Aviation. Rico Rapid Response™ is a Registered Trademark.